﻿ How to Create Emails That Perfectly Match Your Business Brand » Red Mango Marketing! Your products are elegantly crafted, your website is refined, and your mission resonates with your customers. But your email marketing is outdated and needs a facelift. You want to ensure that your professional image is conveyed in your email marketing, but don’t know where to start. How can you extend your upscale branding to your customers’ inboxes? Jennifer Vona, Director of Brand Strategy and Product Development at William Roam, asked herself this same question as she created her first email campaign for the luxury hotel amenities retailer about a year and a half ago. “Your emails need to be representative of your brand, tell a story, and really present your business in the best possible way,” Jennifer explains. One of the best ways to protect an excellent reputation is to only send emails to those who really want to hear about your new products and promotions. It seems like a no-brainer, but while buying a list may be tempting when you’re trying to boost business, it can destroy your reputation and put your business at risk of breaking the law. Tip: Looking for ways to build your email list the right way? Check out our Ultimate Guide to Growing a Massive Email List for 61 fantastic ideas. Because Jennifer sees her emails as an extension of her brand, she’s always looking for opportunities to connect with her audience and make people smile. To promote her Mother’s Day special, Jennifer sent a three-part email series, including an announcement of the special, a reminder, and then a last-chance email. While you may be hesitant to send three emails about a single promotion, Jennifer received a positive response on all three of her emails. Tip: Check out our free virtual workshop for advice on how to plan timely emails and create a three-part promotional email series for your business. 3. Always include a picture, paragraph, and call to action. Jennifer starts by including an eye-catching images in every email s out. After choosing the perfect image, Jennifer keeps the email copy concise and rewards her email subscribers with an exclusive 20 percent off special. She also provides a clear call to action, encouraging subscribers to purchase her products online. Tip: Want to create quick and effective emails for your business? Use this worksheet to write your email in 15 minutes or less. Finely crafted, American-made hotel amenities are not the only thing that William Roam prides itself on. 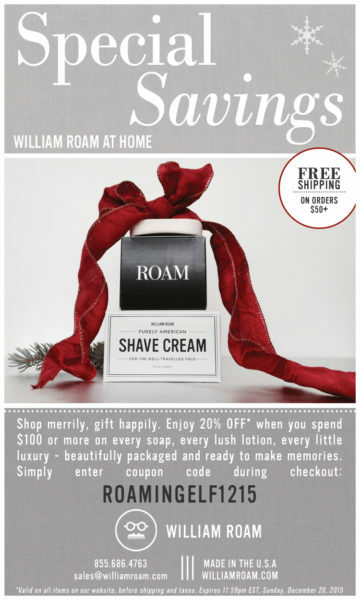 When customers purchase William Roam products, they are helping the company donate one percent of its sales to environmental charities, such as Sustainable Coastlines Hawaii, through 1% For The Planet. 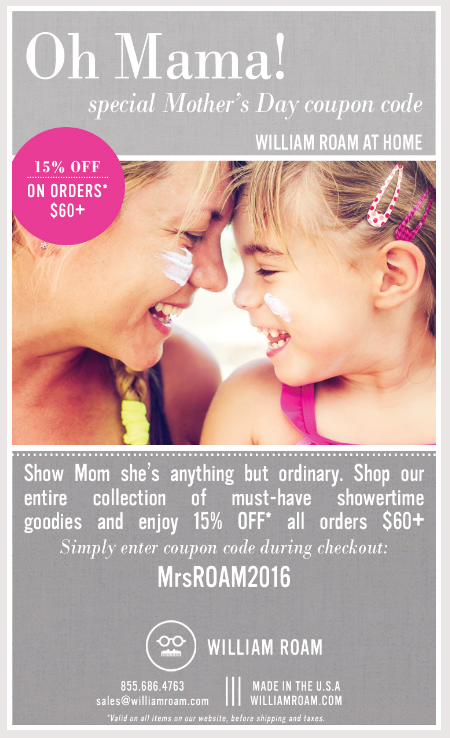 Whenever possible, Jennifer highlights William Roam’s philanthropic efforts in her email marketing. 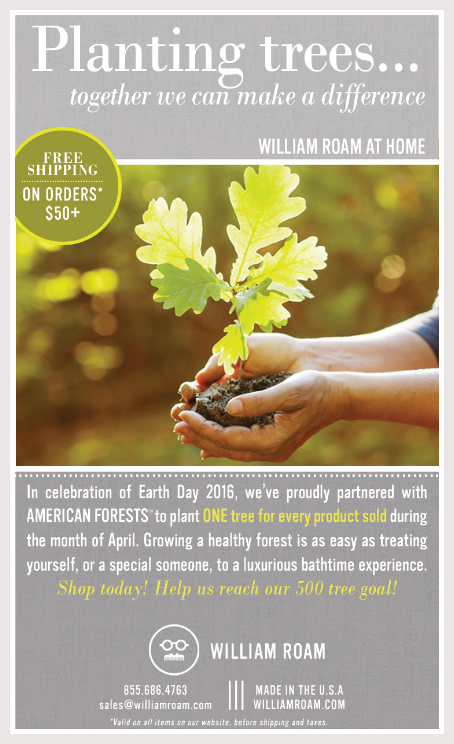 For example, for Earth Day 2016, William Roam partnered with American Forests to plant a tree for every product sold during the month of April. Notify your customers about your philanthropic initiatives, so they know that your brand’s mission goes beyond the products it sells. How does William Roam achieve an average open rate of over 31 percent? Jennifer works hard to deliver the right message to the right people at the right time. Because William Roam caters to both hoteliers and retail customers, Jennifer separates her email subscribers into two lists. But when she noticed her hoteliers list was initially receiving a lower open rate, she was determined to find out why. Tip: Don’t underestimate what you can learn from your email reports. Need some help getting started? Here’s how to interpret your email marketing results, without spending all day doing it. Extend your business’s quality experience to the inbox. Use Jennifer’s tips to get your email marketing on par with the same level of excellence your customers have come to expect from your brand. When you see your email marketing as an extension of your brand, you have a whole new opportunity to deliver quality to your customers and reinforce their brand loyalty. Try these tips out in your next email! Not a Constant Contact customer? Try a free, 60-day trial. 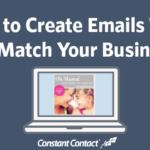 The post How to Create Emails That Perfectly Match Your Business Brand appeared first on Constant Contact Blogs. This entry was posted on Friday, June 3rd, 2016 at 10:00 am	and is filed under Branding, Customer Success Stories, Email Marketing, News & Updates. You can follow any responses to this entry through the RSS 2.0 feed. Both comments and pings are currently closed.